Genuine Aprilaire® 410 Air Purifier Filter replacement for Air Cleaner Models 1410, 2410, 3410, & 4400 is essential for easy replacement of your old filters and can be installed in no time at all. Simply slide your new filter into your air cleaner model 410, 2410, 3410, or 4400 air cleaner and begin circulating clean, fresh air! The Apriliare air filter media in your air cleaner should be changed at least once a year. so if you're past due, now is the time to get rid of that old, useless filter! The Aprilaire 410 Replacement Filter Media can dramatically change the cleanliness of your air by eliminating airborne irritants like pollen, dust, and smoke. Rated as a MERV 11, Aprilaire® 410 filter replacement is one of the most effective, easiest to install filters on the market. 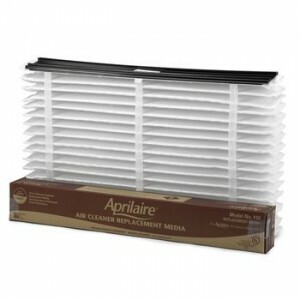 See for yourself and replace your old filter with an Aprilaire 410.